A core idea of film and media studies is that moving images do not simply represent or communicate given meanings but that thinking and meaning is constituted in concrete, situated interactions. One of the prime examples for this is the phenomenon of metaphoricity, for which it can be argued that it consists of a process of emergence in which the very relations that generate meaning themselves are created. With our second issue, mediaesthetics wants to approach this important paradigm in an interdisciplinary fashion, with papers from the fields of philosophy, linguistics and cognitive semiotics, film and media studies and even architectural design. As broad as the range of disciplines is that of the audiovisual presentational forms on which several of the contributions focus: from feature film and animation to science-TV and TV-commercials. The issue presents the vast scope of theoretical assumptions and approaches based on the basal premise that metaphors make it possible to experience one thing by experiencing another. Common discursive threads are the interest in the experiential and multimodal qualities of metaphors, the relation of metaphor to affect as well as the inherent contextuality and dynamics of metaphorical meaning. Together, the contributions demonstrate that and how metaphors themselves can be tools for thought that shape and transform our understanding of reality. mediaesthetics #2 collects contributions from the keynote speakers and selected papers presented at the RaAM 11: Metaphor in the Arts, in Media and Communication. 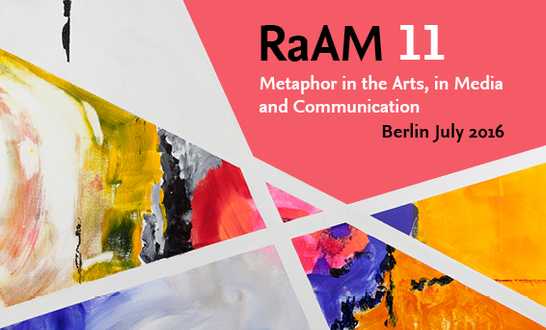 In July 2016, this 11th international conference of the Association for Researching and Applying Metaphor (RaAM) was held at Freie Universität Berlin, organized by Cinepoetics – Center for Advanced Film Studies, together with the Viadrina Center for Dynamic Multimodal Communication (Viadrina European University, Frankfurt / Oder). The first two papers from Petra Gehring and Irene Mittelberg will provide strong and perhaps even controversial theoretical assertions on the definition of metaphor and on the limits of certain uses of the concept as well as its relation to other phenomena like metonomy. In both contributions, the step from language to other phenomena like the visual arts and the use of gestures in face-to-face-communication is applied to foreground the poetic, productive function of metaphoricity. This poetic and productive function then is at center stage in the third paper by José Mario Gutierrez Marquez. As a professional architect and lecturer on architecture, he reflects on the way metaphors can not only be used to communicate and verbalize design processes but actually take a life of their own in guiding and spawning creative decisions. The further papers of this issue focus on metaphoricity in film and audiovisual media from a broad range of different theoretical perspectives and by looking at an equally broad range of genres and formats. The paper by Jennifer Barker presents a close reading of Todd Haynes’ film CAROL (USA, 2015), arguing that metaphoricity and affect are closely related in the way the film orchestrates objects and gestures. Barker shows how narrative and meaning are both generated and dissolved in the temporality of forces, movements and stillnessess, creating a constant tension of tender romance and violent passion. The papers by Thomas Scherer and by Regina Brückner and Sarah Greifenstein are devoted to the question of cinematic metaphors as a specific kind of meaning-making in a more stricter sense, inquiring into techniques of persuasion and the communication of scientific insights. Whereas Scherer looks at metaphors in social advertisements that argue for or caution against certain kinds of behavior, Brückner and Greifenstein examine the way abstract or invisible features of brain activity are made vivid by the use of metaphors. Carmen Hannibal presents a case study that transfers the question of animating abstract meaning through metaphor onto the question of multimodal metaphor in animation film. She combines assumptions from cognitive linguistics and conceptual metaphor theory with ideas of a temporal and expressive grounding of metaphor in embodied experience. The philosophical scope of this issue’s overarching theme is then traced further in the paper by Holger Hartung. He shows what a close attention to a specific metaphorical experiential realm in different appearances and contexts – the “crack” as it appears in contexts as diverse as Ovid, Heidegger and hardware store commercials – can tell us about the role of language in philosophical thinking.